The condition of our world in 2017 requires listening. We are all called upon to relearn how to truly listen. Each of us needs to find better ways of listening to those experiencing pain, grief, oppression, or cruelty; to our friends and neighbors in marginalized communities, and those who are affected by the weight of our broken systems. Through listening comes the necessary understanding of our loved ones, our friends, our community members, and of our shared experiences, of the earth. We heard our sorrows harmonizing with those around us. We heard our fears, our guilt, and our shame in a chorus of voices all feeling the same crap. We heard the sounds of violence in our country echoing the toxic hum of racism and imperialism that reverberates from generations before. All of this we need to listen to and witness. Our future depends on it. We believe that a successful performance comes from a positive, sacred, collaborative, and radically inclusive space. One where every voice can be heard and every anxiety shared freely. Multiple ideas, perspectives, realities, or visions can co-exist simultaneously without attempting to synthesize or simplify the experiences and world views of those involved—but only if we listen. Tonight we listen to our bodies. We listen to our ancestors. Tonight we come to celebrate the unknown with hearts full of gratitude. We come bearing the heavy knowledge that our beloved humanity maybe finding itself in darkness, on a planet trying to say goodbye. Where do we go from here? What if we were humble enough to listen? Thank You Very Special Donors!! BareBones extends our deepest thanks to all our community for your donations. We’d like to extend a special thank you to our donors who have given in advance of the show, whose donations represent a shared faith in the common good of public art. 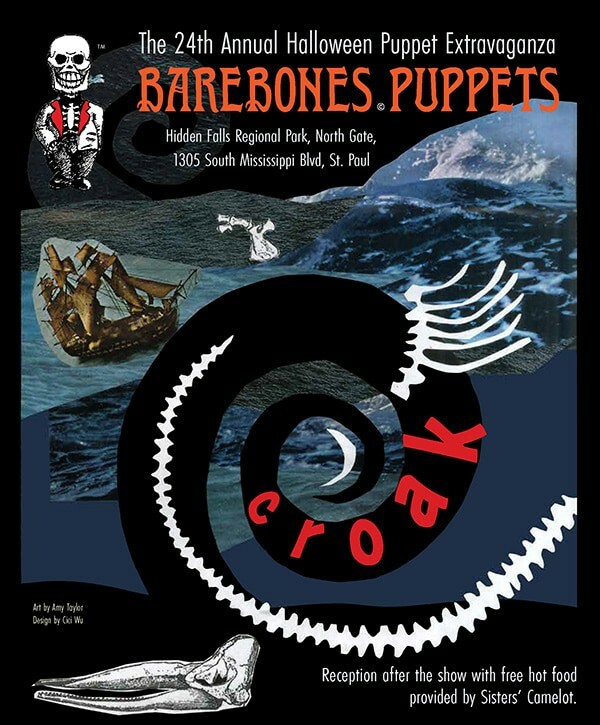 For many years, two remarkably generous donors have given a major financial gift each Fall to support BareBones’ Annual Halloween Outdoor Puppet Extravaganza. We truly honor Joan and Frank (Pancho) Safford of Evanston, Illinois, for their selfless support of outdoor spectacle performance in the Twin Cities. Thank You Joan and Pancho! to the following collaborating, cooperating, and supporting organizations who helped make the 24th Annual BareBones Halloween Puppet Extravaganza possible.